The AJCU Education Deans Conference is comprised of deans and professors for schools of education at Jesuit colleges and universities in the U.S. They meet annually and maintain contact throughout the year via AJCU listserv. The Education Deans Conference has engaged in three major activities in recent years: a collaborative effort of AJCU and other Catholic universities to formulate standards and benchmarks to guide Catholic P-12 schools; a survey of students and recent graduates regarding perceived value of attending a teacher education program at a Jesuit institution; and, the development of a white paper that clearly articulates the commitment of member institutions to Jesuit pedagogy and social justice. 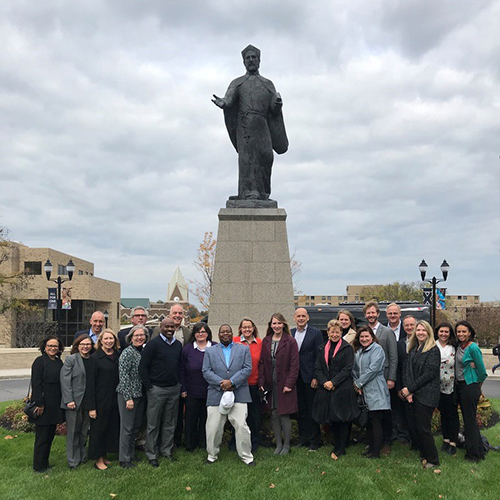 Members of the Education Deans Conference meet annually to network, learn from each other and collaborate on initiatives with colleagues from Jesuit institutions. Discussions and actions are framed in ways consistent with Jesuit and Ignatian foundations. Click here to download the AJCU Education Deans Conference By-Laws, and here to access the Conference’s password-protected page for additional documents.